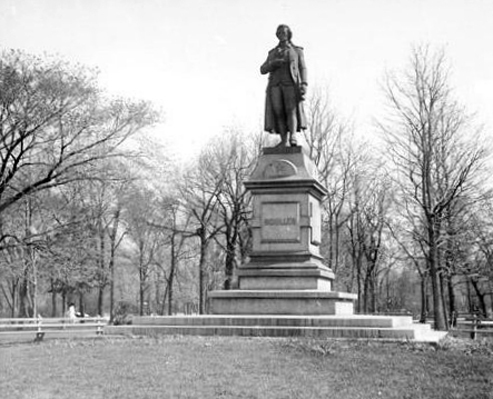 May 18, 1886 –The Schiller Monument in Lincoln Park is unveiled on a Saturday afternoon before 7,000 people, including members of 60 separate German societies and lodges of the city. Mayor Carter Harrison and William Rapp, editor of the Staats-Zeitung, make speeches appropriate to the occasion. 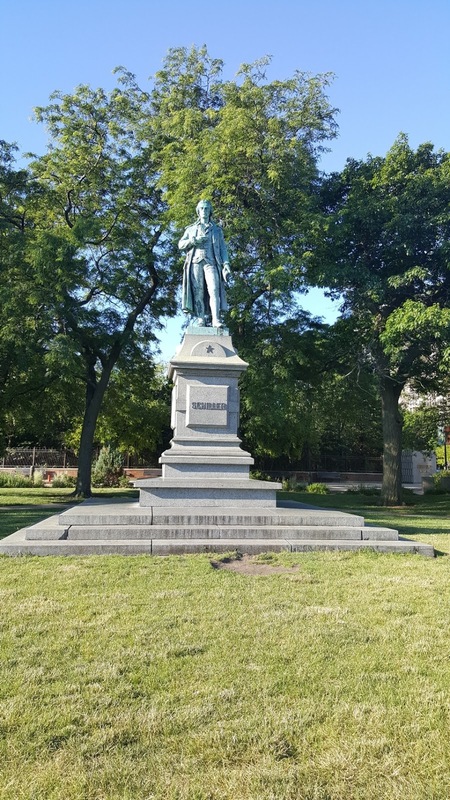 The Chicago statue is recast from a model of the original sculpture that stands in Marbach, the birthplace of Johann Christoph Friedrich von Schiller. The original sculptor was Ernst Rau. According to the Chicago Park District a large number of German immigrants held a meeting in Turner Hall, after spending several years raising money for the monument, and subsequently placed a cornerstone and foundation for the work in Lincoln Park. 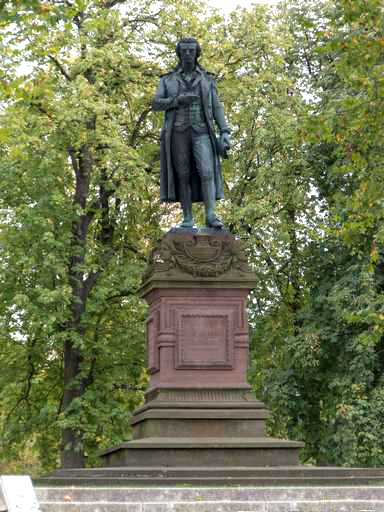 William Pelargus, a sculptor from Stuttgard, was hired to recast the original Marbach monument, and a Lake View stone cutter was given the commission to create the granite base. The Laing and Son Granite Company repaired the monument in 1959 and installed a bronze plaque on the base. 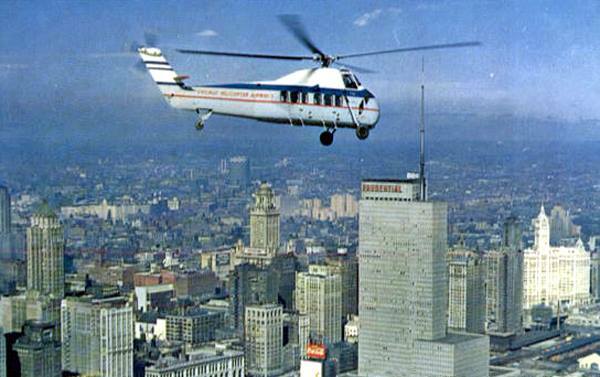 It still stands in its original location. The top photo shows the original monument in Marbach. Below that is the memorial as it looked in the early 1900's. It is not much changed today, as can be seen in the final photo. May 18, 1878 – The cornerstone is placed for the First Regiment’s armory on Jackson Street between Wabash and Michigan Avenues, celebrated in “one of the finest military parades and reviews that has taken place in this city for years.” [Chicago Daily Tribune, May 15, 1878] The first meeting to organize a National Guard regiment in Chicago took place on August 28, 1874 with the militia funded through private donations. George M. Pullman contributed the first $500 with 22 of the city’s leading citizens contributing $100 apiece. The first drill hall was established at 112 Lake Street. In February of 1875 the First Regiment assembled as demonstrations swept the downtown area. The six companies of the regiment were credited with saving the city from almost certain rioting as the men encamped in the armory. The members of the regiment, still without a suitable place to call home, played an instrumental role in putting down the disturbances that came in July of 1877 during the rioting that occurred during the railroad strike, stationing cannons on the Twelfth and Sixteenth Street bridges. Finally, the First Regiment dedicated its new armory on the site of the old Trinity Church on October 29, 1878. The armory remained open until 1900 when a new armory was begun farther south on Michigan Avenue. 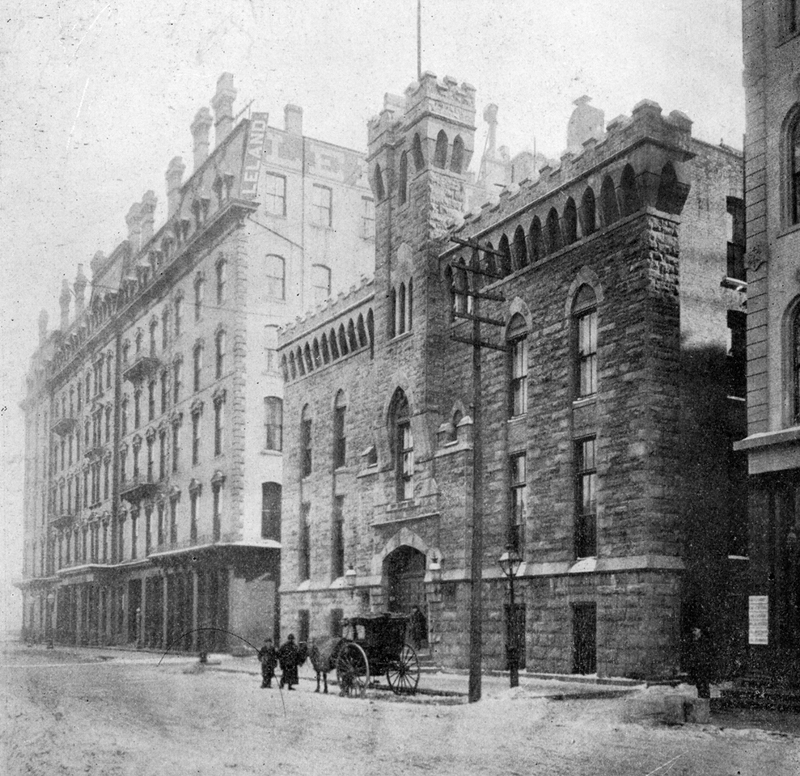 The above photo shows the armory as it stood on Jackson next to the Leiland Hotel.